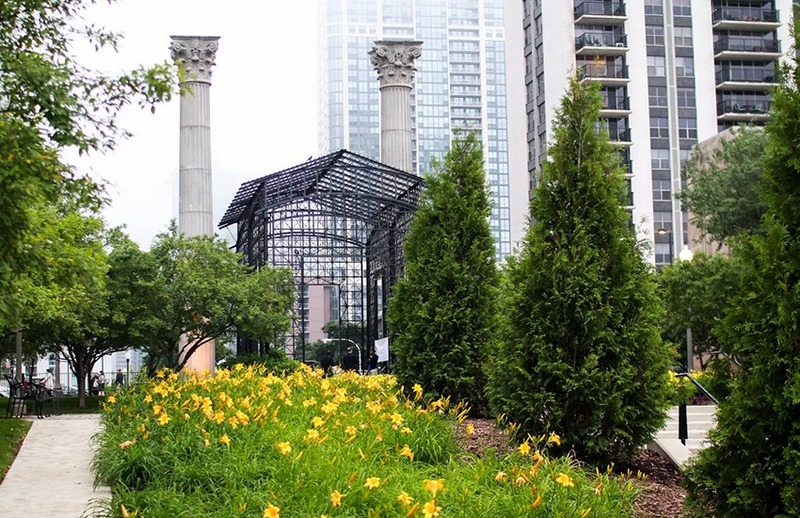 Completed in 1996, the Cancer Survivors’ Garden is considered a hidden treasure in the heart of the city. Located on the east side of the park, the garden provides views of Lake Michigan and the Field Museum of Natural History. On the north end, two forty-foot tall granite columns flank a large open metal pavilion and flowers line this area in the spring and summer. The garden was designed to be a celebration of life and give hope in the midst of a memorable garden setting. The contemplative garden design represents a metaphorical process of recognition and self-knowledge that is crucial to healing. The three main garden rooms represent the three main states of healing: acceptance, support and celebration. Today, the Cancer Survivors’ Garden is a popular location for weddings and other special events.